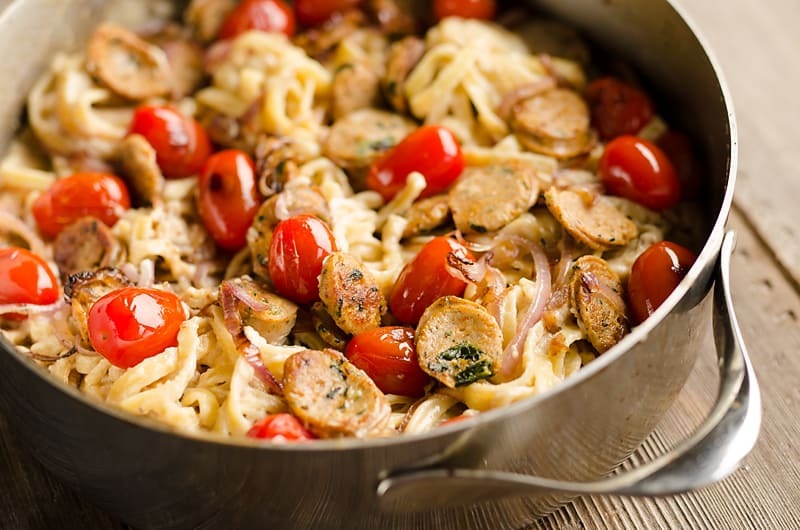 This Chicken Sausage Fettuccine Alfredo is full of so many great flavors, it is sure to be a hit with the whole family! 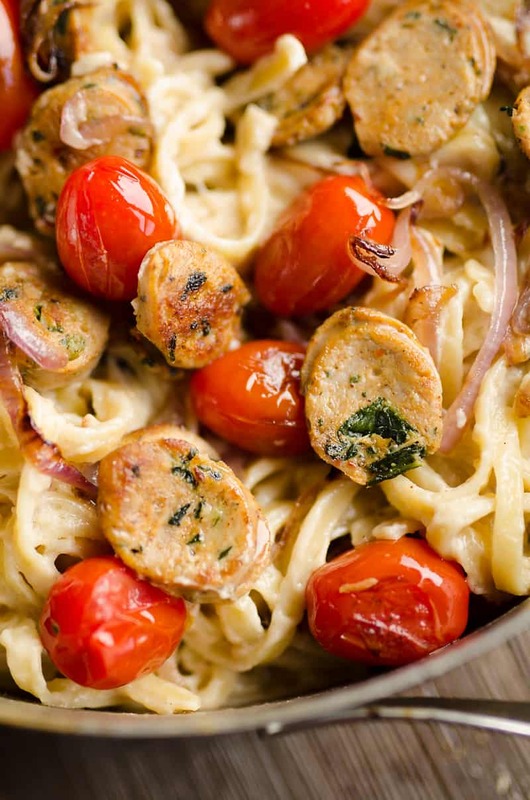 From the flavorful Gold’n Plump Spinach & Asiago Chicken Sausage to the caramelized onions and fresh tomatoes, this hearty recipe is bursting with flavor. 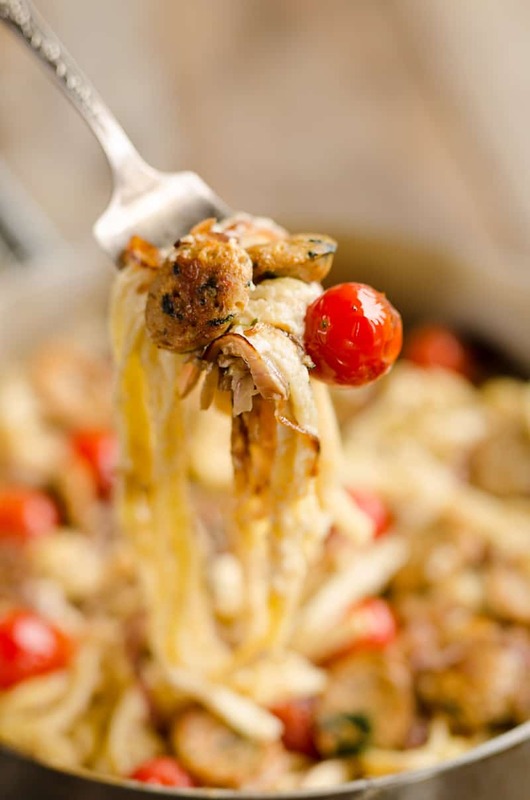 Whether you are looking for a quick and easy weeknight meal or something comforting for a Sunday dinner, this Chicken Sausage Fettuccine Alfredo is a must try! Gold’n Plump Fully Cooked Sausages are made with premium boneless skinless chicken thigh meat from chickens raised with no antibiotics—ever, and include real ingredients. In addition to the Spinach & Asiago chicken sausages, the product comes in other great varieties including Jalapeño Cheddar, Italian Cheese & Peppers, Hickory Smoked Apple and Bacon Gouda. Each variety is full of flavor and work with an array of dishes. 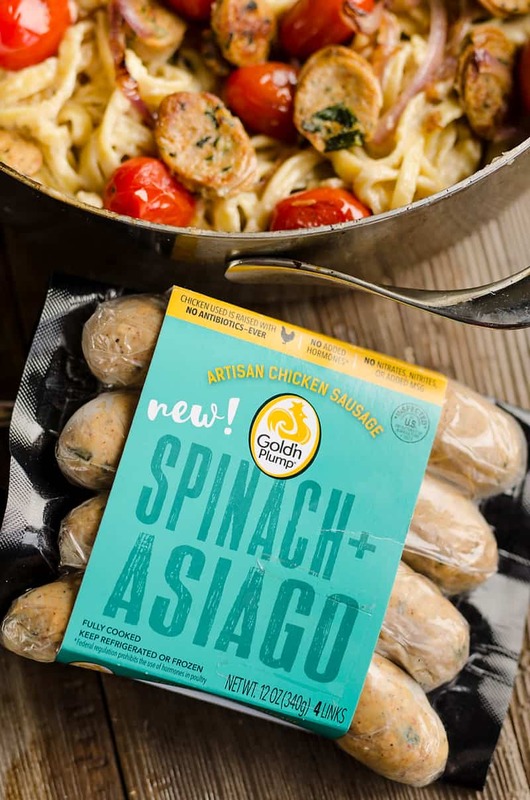 These Gold’n Plump chicken sausages pack 14 to 15 grams of high-quality protein per link and less fat than pork sausages. 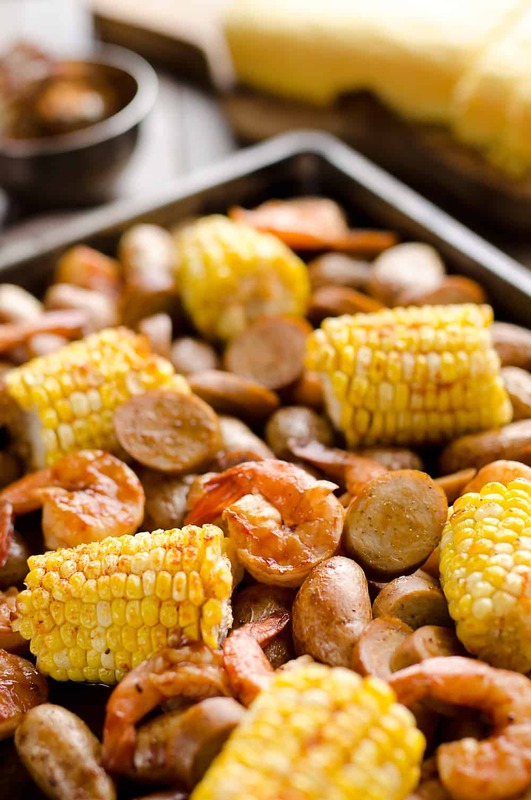 Whether you throw some sausages on the grill and serve them with veggies and a potato or toss them on a flatbread or salad, they add great protein to just about any dish! 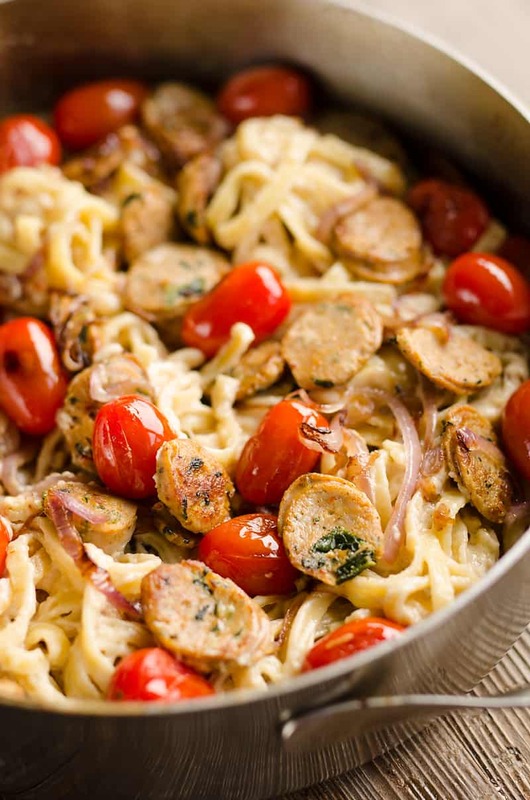 Grab a large skillet and a pot of boiling water and you will have this easy Chicken Sausage Fettuccine Alfredo ready for a weeknight dinner in just 20 minutes! 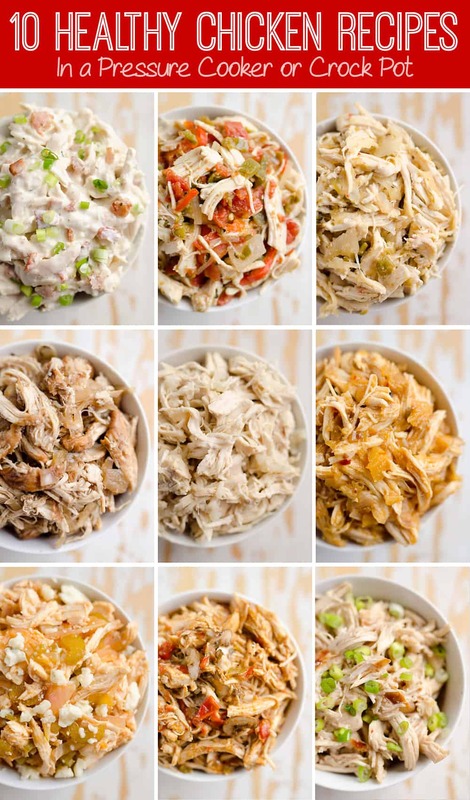 Not only does it make a great meal, the leftovers are fantastic for lunch the next day. There is nothing better than a hearty dish that you can enjoy for a couple of meals with minimal hassle! 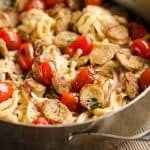 Chicken Sausage Fettuccine Alfredo is a quick and easy 20 minute weeknight dinner recipe full of hearty pasta, chicken sausage, blistered tomatoes and caramelized onions. The rich flavors are sure to be a family favorite! In a large skillet over medium-high heat, add 1 tablespoon olive oil and red onions to the pan with a pinch of salt, and stir occasionally. Meanwhile, add the pasta to a pot of boiling salted water and cook according to the package directions. After the onions have cooked for 6 minutes, push them to the side of the pan. Slice the chicken sausages diagonally into 1/4 inch slices and add them to the pan with a tablespoon of olive oil and the cherry tomatoes. Cook for 4-5 minutes or until the sausage is heated through. Drain the pasta, reserving 1/2 cup of the pasta water. Add the fettuccine, reserved pasta water, Alfredo sauce and Parmesan to the skillet with the sausage and veggies. Toss everything until it is well combined and the Alfredo sauce is heated through. More great chicken sausage recipes! 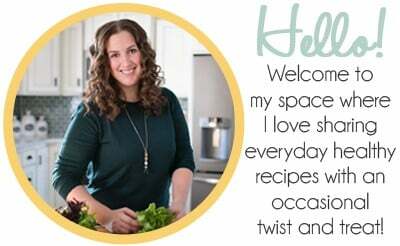 Any chicken recipe is a must-try for me! This one is looking pretty special, will definitely try this weekend! I just finished making this and its DELICIOUS!! A must try if you haven’t!